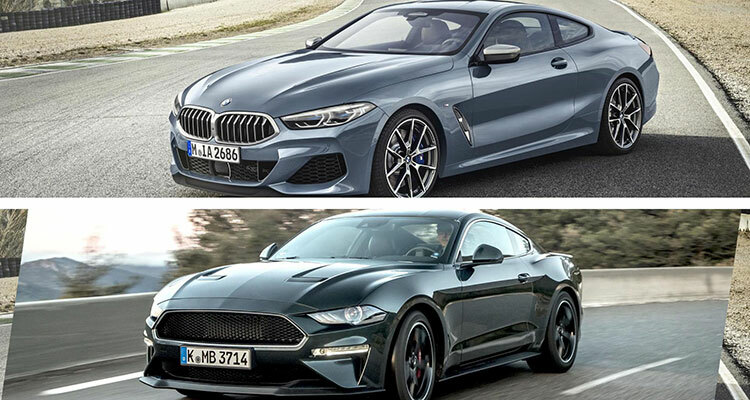 Many people have criticised the new BMW 8 Series for looking too much like the Ford Mustang so we’ve put some side by side comparisons together to see just what people are talking about. The two cars are different by design, with the BMW aiming to be a luxurious package filled with fancy tech and posh things like a glass gear selector. The Mustang, on the other hand, has to live up to the reputation of “the coolest muscle car available” and offer the “adrenaline-pumping” (as they say on the website) experience that has become synonymous with the Mustang brand. 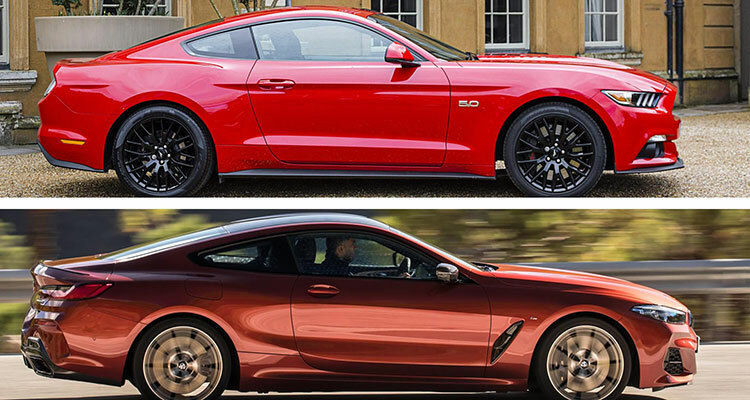 The Mustang can be bought for around half the price of an 8 Series and has been in production since 2015, unlike the brand-new 8 Series which went on sale late last year. There are only so many shapes a coupe can be and there’s bound to be some overlap. 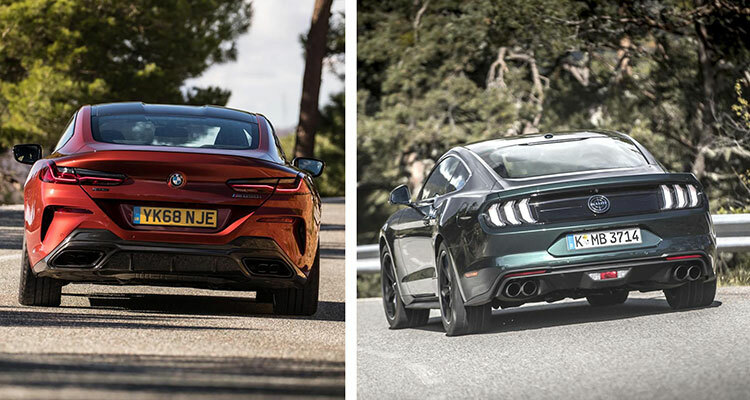 From this rear/side view of the two superb cars, the 8 Series looks a little more sleek and elongated compared to the Mustang. The boot appears to jut out more on the Bimmer but other than that, there’s not much difference at all! The rear lights are completely different, there’s no arguing that. From this angle, it’d be hard for anyone to argue that these cars look too similar. 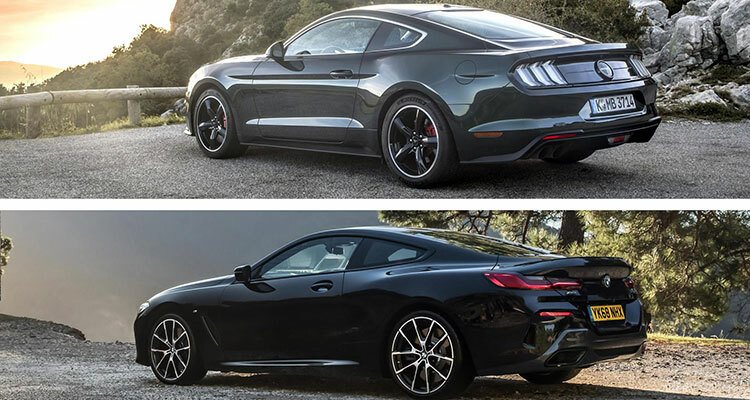 From the front, some could argue the two share similarities, although the two kidney grilles and the singular wide grille on this Bullitt Mustang couldn’t look more different. What do you think? As expected, the interiors of the two cars are worlds apart. After all, why would BMW need to copy the Mustang interior when they’ve become so good at pasting their own near-identical interiors, time and time again? The 8 Series features some amazing-looking leather, an exquisite glass gear selector (found in other high-end BMWs) and a digital gauge cluster. The 2019 Mustang also features a digital gauge cluster and unfortunately also features a lot more plastic, in true Ford fashion. The screen looks a bit less elegant than the one found in the 8 Series as does the rest of the interior, but people don’t purchase a Mustang for a fancy interior now do they. However, judging from the side profile, do you think the two cars look alike? Let us know if you agree with all the people that say they do. A lot of cars look similar these days … especially coupe’s . It dosen’t really matter anyway … both of these cars look brilliant . Would go for the brutal looks of the Mustang if I had to choose though ! BMW make some brilliant cars but their ten a penny on British roads .